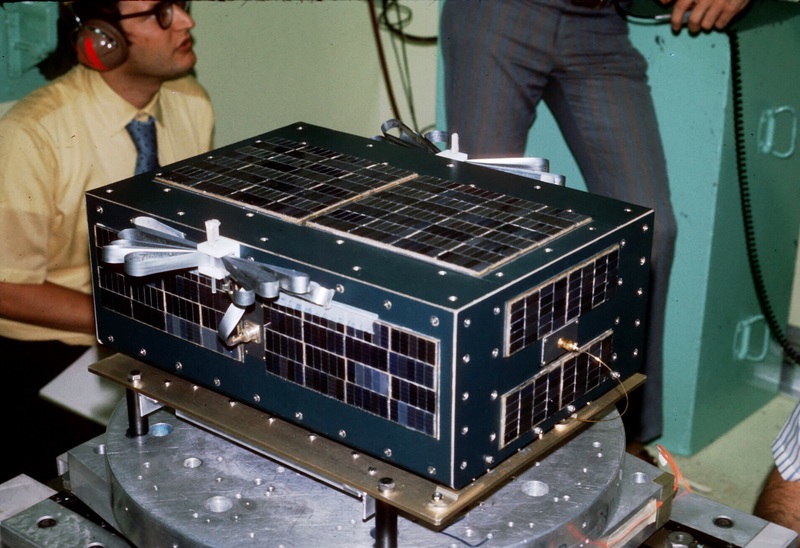 After the launch of AMSAT-OSCAR 6 in October 1972, it was apparent that many UK Radio Amateurs attempting to utilise the satellites were meeting problems due to shortage of orbital information, correct power to use, and the demanding requirements of basic reception techniques. This is still true of newcomers today, despite the publications we produce. To give some assistance to newcomers, we produced OSCAR News . This was a free periodical to those sending an SAE. It contained updated information on recommended equipment, active stations on OSCAR, Hints & Kinks, and listed orbits with reference and general advice. Within six months, demand had outstripped the supply of free paper, and printing costs had increased. Donations were sought to permit the larger editions required. Most enthusiasts were in the UK – but an increasing number were overseas. Oscar News received the support of AMSAT-USA and republished many articles from the AMSAT Journal. In 1975, with the backing of AMSAT-USA (now AMSAT-NA), AMSAT-UK was formed and OSCAR News took the form of a bi-monthly bulletin for members, plus membership of AMSAT-USA at no extra cost. At that time the minimum donation for all services including Oscar News was £4.00 per annum. There are separate rates for UK based and Rest of the World based members, to cover the extra cost of posting OSCAR News (by airmail). A cheaper, and faster, option is E-membership with OSCAR News available for download as a PDF. The rates are shown on the online shop, or on the paper membership application/renewal forms. Today, apart from providing valuable assistance to the Amateur satellite programme, AMSAT-UK has an information service second to none, a first class magazine in OSCAR News (free to members at least every three months), and provides technical data and advice on all aspects of amateur satellite communications. Orbital data and general assistance to all radio amateurs wishing to enter this specialised part of the hobby is still available at minimal cost. AMSAT-UK supports the design and building of apparatus for future OSCAR launches and user equipment. AMSAT-UK is affiliated to RSGB and liaises with IARU, the vital link between OSCAR users and the ITU administration in Geneva. AMSAT-UK exists by DONATIONS. Most donations go towards the building and design of Amateur Satellites, and the Command Stations worldwide. Please remember this when you send your yearly donation. We currently have satellites being built in Germany, USA, Japan and the UK. Most construction of Amateur Radio satellites is carried out by fellow radio amateurs who all give their services freely. Membership of AMSAT-UK will help you to keep up with the ever-changing trends in the Amateur Satellite world. Please give generously to this modern branch of our hobby. The current minimum UK donation is £18 (£15 for E-membership), the maximum is as much as you can afford; Please go to http://shop.amsat.org.uk to join/renew/ on line. Part of all donations goes towards building, launch, and support funds for amateur satellites. If you cannot join/renew your membership on-line, please email the Hon Sec (g3wgm -at- amsat.org) for a paper based form. A paper form is normally distributed with the Dec/Jan issue of OSCAR News. A regular radio net on 3.780 MHz meets on most Sundays at 10.00am (local time). Members are encouraged to listen to these nets for up-to-date information; the net held on the last Sunday of each month contains a roundup of the month’s news. AMSAT-UK holds the callsign G0AUK. All work on your behalf is carried out by fellow radio amateurs in their spare time.